So it’s back to school time!!! And here’s a “back to school SPECIAL” Little Johnny posting. I had a hard time sifting through all of the Little Johnny in-school propaganda. There are almost as many stories that start with “little Johnny was in school” than there are “soap words” in an EMINEM song! By the way, have you seen the “new” PopTarts that aren’t REALLY new? Every day before school I used to eat a pack of my FAV PopTarts, Vanilla PopTarts (chocolate pastry, vanilla cream filling with a white icing speckled with chocolate sprinkles). As an adult, they were STILL my favorite. Suddenly they went “D.B Cooper” on me a few months ago. Couldn’t find them anywhere! This week, with the announcement of the new PopTart Store in Manhattan, guess what I found? 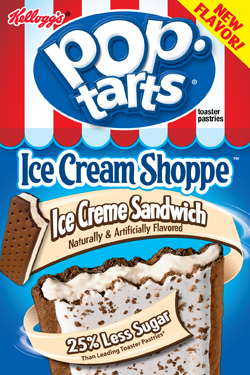 A “New Flavor” Ice Cream Sandwich PopTarts! They are the exact same thing as the long lost Vanilla PopTarts. I’m back in business for a quickie breakfast WITHOUT eating those gas-causing oatmeal bars. Little Johnny gets transferred to a catholic school from a Jewish private school because he wasn’t doing well enough in math. Within 2 weeks, Johnny is getting straight A’s on all of his math homework and quizzes. Johnny’s parents can’t believe the dramatic change. So they met with the teachers who explained that Johnny had been very attentive in math class since day one. By the way, I am dunking a toasted PopTart in milk while I am writing this! My keyboard’s a mess but I got hungry for one while I was writing about them! So the back-to-school story above puts me first in a Jewish school, transferring to a Catholic school. Not true! My parents were more brutal than that. I did HARD time. They put me in Catholic school all the way to the 8th grade!!! 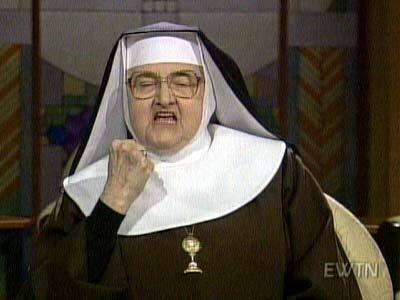 My principal was Sister Mary Stalag the 13th. The other thing is I was a math whiz from early on. That’s cuz every time Sister Anecita hosted detention, she made us do long-handed division and multiplication problems like, 1,563,413 ÷ 206,794. And you had to show all your work. I knew math better than Donald Trump’s bankruptcy attorney. One final note. About me not knowing the difference between a crucifix and a naked guy hanging on a plus sign for not knowing his math homework…can we give Johnny SOME credit for having at least an average I.Q. as a kid? I mean, at THAT age, I even knew that Mr. Rogers didn’t’ REALLY talk to the trolley and, while I DIDN’T know why, I knew that Big Bird was using Mr. Snuffleupagus as a SCAPEGOAT in a very scandalous, soap opera, kind of way. By the way, ya know who SHOULD hang from a plus sign naked? They guy who cancelled the production of Vanilla PopTarts a few months ago!